Many novels and memoirs talk about the coming of age concept, specifically those of South Asian American youngsters. 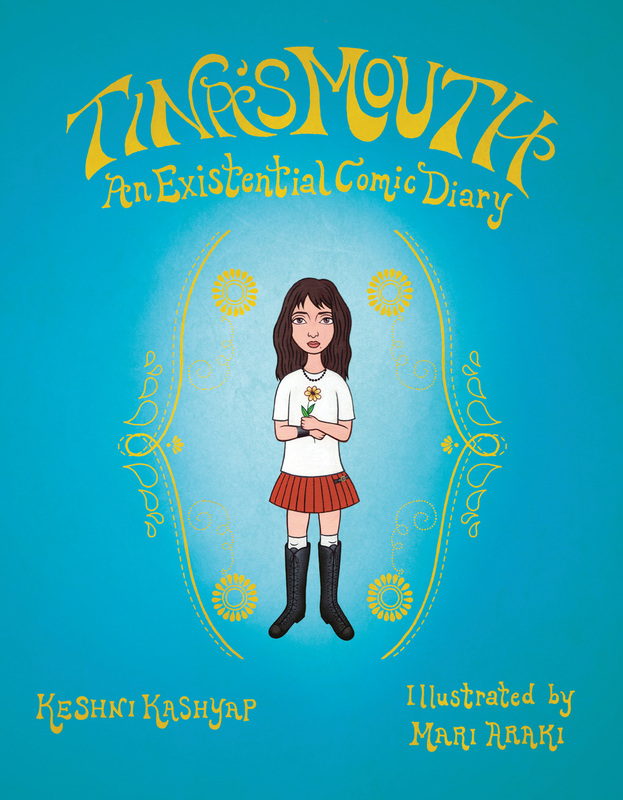 This however is a different take on these coming of age books, in that it is a graphic novel with a highly comic edge. 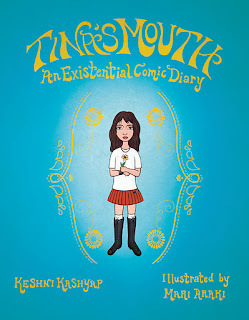 Now in her 30's, author Keshni Kashyap spent four years working on Tina's Mouth: An Existential Diary, with illustrator Mari Araki which was published in January 2012. The pair had to teach themselves the comic form while melding the book's substantial text with some 1,000 drawings. 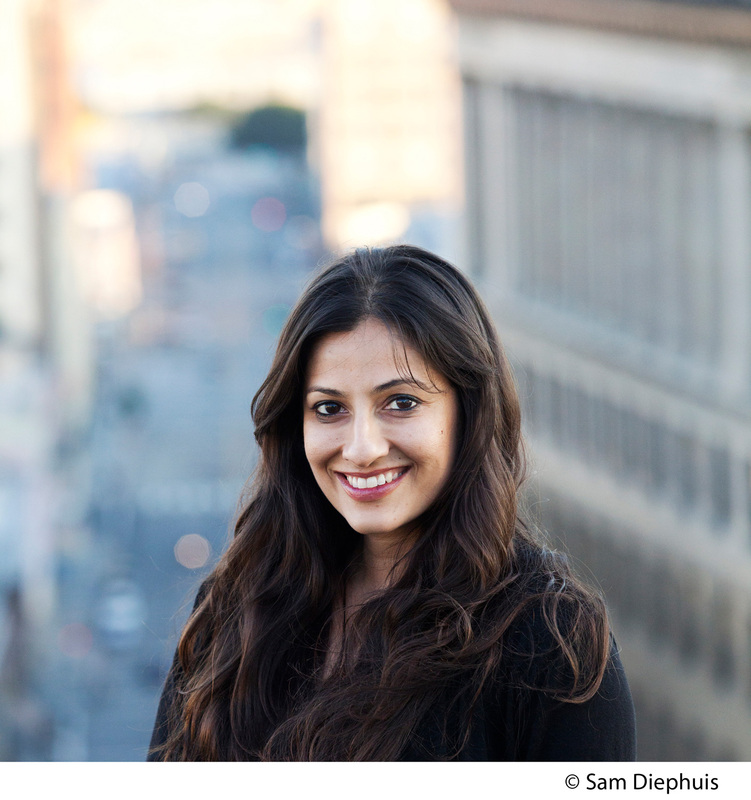 Raised in Los Angeles, Keshni Kashyap studied literature at Berkeley and film at UCLA. A filmmaker whose five short films have been screened in more than forty festivals around the world including a short film at the IAAC Film Festival (now NYIFF), Tina's Mouth is her first book and a collaboration with Los Angeles-based Japanese painter Mari Araki. Kashyap lives in New York and is at work on two new projects. Keshni also contributes occasionally to The Daily Beast. While on book tour, Kashyap was kind enough to take some time to do this interview with Suprose. I guess I've always loved books, so maybe that's how I started. But, I've also always written: poems, plays, screenplays. Many that just sit on my desktop! My mom always encouraged me to write. Before she was married, she worked for PEN International in India so she also had a love of books and literature. She, like many Indians, is very particular about the English language and would spend a lot of time helping me use it properly. She loves words and always encouraged me to love and respect words and use them carefully. She's like Henry Higgins! I'm really lucky to have had a mom like that. Why a graphic novel versus others? I studied directing in graduate school and wrote scripts and made short films. When I finished my MFA, I became interested in graphic novels as a form of visual storytelling and started working on one with Mari who I met through an acquaintance. It was just one project I was working on and it happened to sell to a publisher. I always loved movies with voice-overs. When done well, they can be so rich, almost novelistic. 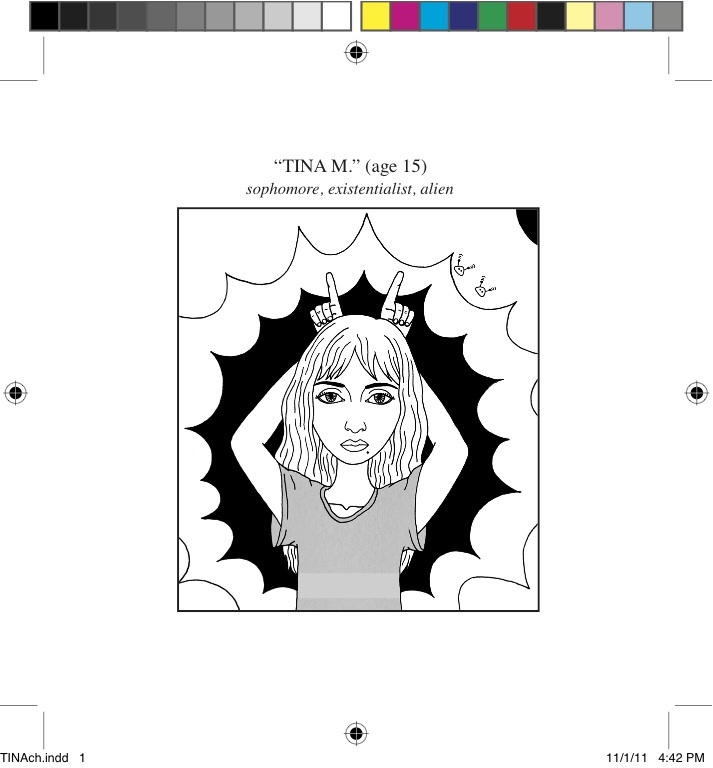 I felt that you can do some really interesting things with images and words in a graphic novel. I found the story fascinating and very true to many Indian Americans growing up at the crossroads of two distinct cultures. How and why is this subject dear to you? I just wanted to write specifically about what I knew. So, since I grew up as an Indian American, that's what I was drawn to. What are your experiences growing up? Is the protagonist a reflection of you? There are certainly autobiographical elements to the story, but I also made up many things. And, also, Mari obviously had a role in the protagonist's reflection. We took from ideas, people, places we've observed over time. What was the audience you wrote this book for? Do you anticipate/hope that the reach will be wider? 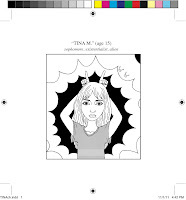 Mari and I made the book with young adults in mind, though we were hoping to swing from young teen to 40. It was written with accessibility in mind. In elementary school I remember absolutely loving the Anastasia Krupnik series by Lois Lowry, Madeleine L'Engle, Louisa May Alcott (I would read and re-read Little Women, Little Men, all of them!) and the Natalie Babbitt books The Search for Delicious and Tuck Everlasting. I was also obsessed with Road Dahl (I think I still am), which may have given me an appreciation for absurdity at a young age. I also, like all Indian kids, loved Amar Chitra Kathas. As I grew, I read more world literature, as my mom would read a lot of Indian fiction. I was an English major in college, so I just read a lot. What do you read now? What books would one find on your bedside table? Well, I just walked over to my bedside table. There is Emerald City by Jennifer Egan, The Diary of Anais Nin, Holidays on Ice by David Sedaris and a graphic novel called the Harappa Files by an Indian comic book writer named Sarnath Bannerjee. What I'll actually get through, I'm not sure. A friend just gave me a trilogy of books by Roberto Bolano and I'm excited to get into those. Who are some writers who inspired you to write? That's such a hard question to answer because it just depends. Generally speaking, I get really inspired when I read Joan Didion. I recently read Sherman Alexie's The Absolutely True Diary of a Part Time Indian and I found that incredibly inspiring. But, those two writers couldn't be further from each other, so go figure! I also get inspired by movie writing. Billy Wilder is a sure bet. Recently, I just loved Young Adult by Diablo Cody and thought that was a really wonderful, brave script. Getting a book published is not easy. How did you go about getting it published? Mari and I created a 60-page prototype which we then sent to a few agents and editors. An editor at Houghton Mifflin Harcourt liked the prototype but wanted to publish it as a longer version. I worked on an outline of the longer book, which she then bought after introducing me to an agent. Well, I've only written one book and, that too, it's a graphic novel. So, I'm not sure if I'm really the best person to give advice! Just write every day, I guess. That's what I try to do. Sort problems and questions you might have out with your writing. What’s next for you? Any other novels/books you are working on? I loved reading the interview and look forward to reading the book. My 12 year-old would also love to read the book especially since it has a comic edge. He will be thrilled to know that an Indian American author loves some of the books that he has enjoyed reading. What intrigues me reading this interview is the addition of graphic sketches in the novel. This concept seems to be unique and I would like to read it when the book becomes available. What a poised author! The book has a very inteeresting concept. I would love to read this book. I'm sure she'll be a good YA author as well. Lovely interview, Visi. Keshni, I've waited to see your work ever since I first heard of it from Pooja Makhijani, oh, maybe a year or so ago. I'm thrilled this book was picked up by HMH and can't wait to read it. The subject matter seems quite interesting to me. As an immigrant parent I have always known that we have chosen an uncharted legacy for our children. 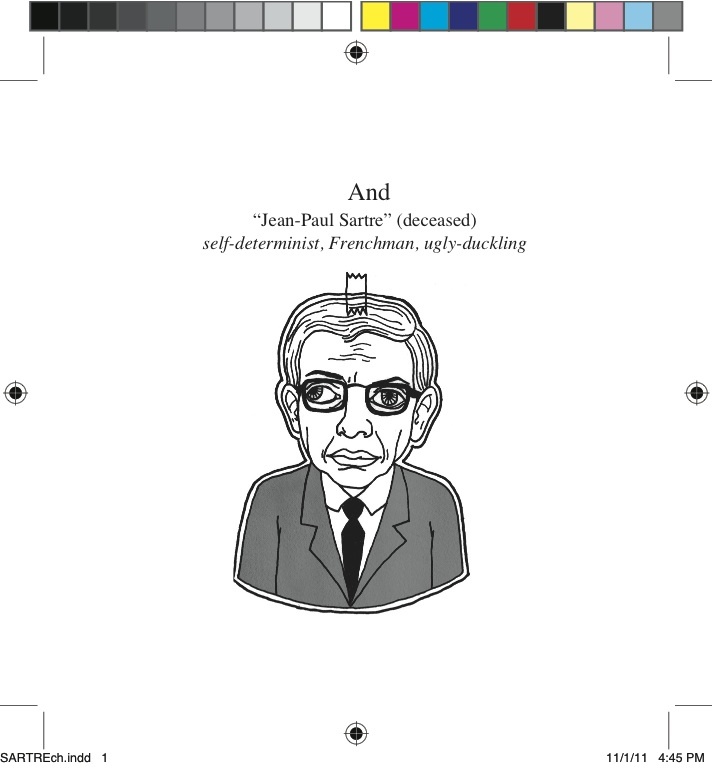 I am sure the book would provide some insight and delight the reader with the graphics. It makes for an interesting combination. Thanks for highlighting the interview. I am super thrilled that this book has more than 800 illustrations - goes to prove that books are not only for readers, storytelling through visuals - I am sure it will capture my daughter's artistic interest and she can derive the same pleasure as me from the book. Looking forward to Keshni's masterpieces, in addition to this print work, many more, hopefully in celluloid! i liked the interview Vissi. The subject is interesting and I eagerly look forward to reading a novel with illustrations. Just finished reading the book, and quite enjoyed it! and enjoyed reading this interview too, as I had some questions, so thanks for posting this! Congratulations winners. You should be getting an email from me soon. Make sure you come back for next months giveaway, which will be announced later this week.